Worm bin acidity can lead to a phenomenon known as protein poisoning (also known as string-of-pearls or sour crop). A good worm bin should smell earthy. If your worm bin smells rotten and vinegary, then worm bin acidity may likely be too high. Nutrients become unavailable to plants when the soil is too acidic. Just like plants, compost worms and microorganisms thrive under the same acidic conditions as plants. Acidic conditions can irritate and burn the skin of your worms. 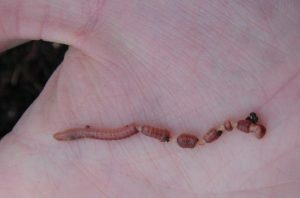 In this article, we will look at the science behind what causes an acidic worm farm, and some ways to fix it. In chemistry, acidity refers to the concentration of hydrogen ions (H+). An increase in the number of hydrogen ions thus increases acidity. An acid is anything that donates a hydrogen ion (H+). A base is anything that accepts a hydrogen ion (e.g. HO2-). A base is also called Alkaline. When acids and bases mix together, they neutralize each other. The opposite of a hydrogen ion is a hydroxide ion. So the more hydroxide ions there are, the more alkaline the solution is. A logarithmic scale is used to measure acidity. It is called pH (power of Hydrogen) and it starts from 0 (acidic) to 14 (base or alkaline), where 7 is neutral. For example, lemon juice is at pH 2, pure water is neutral and seawater is at pH 8. Worms work best in neutral soil. A good pH level for a worm farm is between 6 and 7. However most species of composting worms and quite tolerant of acidic conditions. Adding too many foods that are high in acidity – In general, grains, sugars, citrus fruits, dairy products, processed foods and high protein foods are low in pH. The nitrogen cycle helps to explain why the decomposition of organic matter increases acidity. 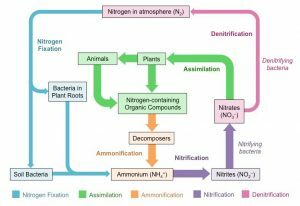 Throughout the nitrogen cycle, bacteria changes nitrogen into many different forms. Ammonia is part of the nitrogen cycle. It is produced in soil from bacterial processes and also from decomposition of organic matter. Note a high C:N ratio can slow the decomposition rate. Most of the chemical processes which deal with ammonia also produce hydrogen ions. If you overfeed your worms, any excess food will begin to rot and decompose; which generates more ammonia. Add calcium carbonate materials such as crushed eggshells and or agricultural lime (e.g. dolomite and crushed limestone) to neutralize acidity and increase the pH. Note limestone is not soluble in water so layer it over the top and mix it in a little. Assist the decomposition process by improving airflow. Gently aerate the worm bedding. Add some fresh bedding to offset the pH level in the bin. Remove any uneaten foods which may be rotting in the bin. Calcium carbonate is a base which reacts with acids and becomes carbon dioxide and water. Carbonate is the key player in neutralizing acid. It’s always a good idea to have a bag of crushed agriculture lime on hand. Do not use hydrated lime as this can harm and kill your worms. Some people bake eggshells in the over prior to adding in the worm bin to remove any pathogens that may be present. I don’t worry about this. You can also pulverize or crush the eggshells into bits that are small enough for your worms to ingest. Eggshells are also a rich source of calcium and give grit to worms which helps them digest other foods. If your worm bin is too moist, it can become anaerobic (meaning no oxygen). Anaerobic decomposition produces hydrogen sulfide gas which smells like rotten eggs. In wet conditions, ammonia acts as basic or alkaline solution (raising pH). With an alkaline worm bin, you need to get rid of some of that ammonia! Remove any uneaten food which may be fermenting in the bin. Add some carbon materials such as wood chips and acidic materials such as sulfur, coffee grounds and peat moss. Note sulfur is not soluble in water so layer it over the top and mix it in a little. Add nitrogen rich organic matter (e.g. manure) to slowly reduce the pH over time. As organic matter decomposes, bacteria produces acid by-products such as ammonia. Fight fire with fire! An acidic worm bin can lead to a phenomenon known as protein poisoning (also known as string-of-pearls or sour crop). A nutrient is a substance used by an organism to survive, grow, and reproduce. Protein is one of the three macro-nutrients, along with fat and carbohydrate. Protein poisoning is an acute form of malnutrition, believed to be caused by a near complete absence of fat in the diet. Early American explorers that survived solely on lean meat, such as rabbits, sometimes developed medical problems which resembled starvation. Worm bin acidity can be deadly to your worms. If your worms become deformed, discolored or dismembered, it is referred to as protein poisoning (also known as sour crop or string-of-pearls). If your worms are trying to escape and appear deformed, even with sufficient bedding and food available, then this is a sure sign of protein poisoning. The most common cause of protein poisoning in worms is overfeeding. Protein rich foods are also high in nitrogen. As protein breaks down, it will increase acidity unless it’s neutralized with calcium for example. There are mixed opinions on what is happening to the worms when too much protein is consumed. However, a popular hypothesis is that sometimes too much acidic food passes into the worms intestines, which ruptures due to a pressure build up from fermented gasses. The worms digestive tract consists of pharynx, the esophagus, the crop, the intestine and then the gizzard. Normally, acidic foods are neutralized before it reaches the worms intestines by calciferous glands which excrete calcium carbonate. When a worm is afflicted by protein poisoning they sometimes have bloated segments alternating with squeezed or narrowed sections in between – hence the nickname String-of-Pearls. You can use a pH meter to measure acidity in a worm bin. There are also ph test strips available. Make sure you take a few readings in different spots to get a more accurate measure. If you don’t have a meter, you can apply the smell test. Does your bin smell wet, musty, rotten or mildewy? If so, you very likely might have pH issues. However a foul odors does not necessarily mean you have a pH issue. It can also be caused by excessive moist conditions. My wormfarm castings and worm juice is very alkaline. I have measured the castings and juice separately on several occasions with a PH test kit and strips. It is so purple, PH level reaches about 9. Have you any ideas to help me? A pH reading of 9 is very high. The ideal pH range for worms is between 6 and 7. Just to be sure, I’d retest using a different brand or even buy a pH meter for improved accuracy. The pH in the bin largely depends on the food you’re putting in and water. Acid and alkaline neutralise each other. But water can go either way. Acidic substances can become alkaline with water. So be careful not to add too much water in the bin. If you have added too much food, it will start to ferment when wet and become alkaline. So remove any uneaten food which may be fermenting in the bin. Quick fixes include removing any uneaten foods that may be fermenting in the bin and adding some carbon materials to try and neutralise the pH.